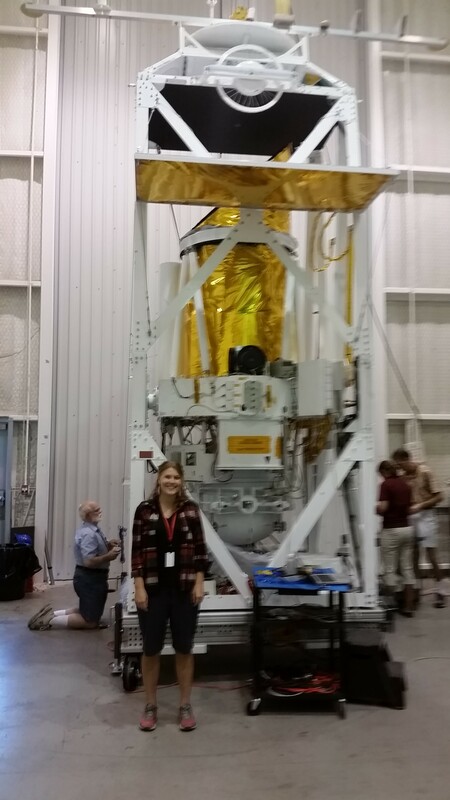 I am a graduate student at ASU working on the Stratospheric Terahertz Observatory reflight mission, STO-2. STO-2 is a telescope that hangs underneath a very large helium balloon. The balloon inflates to ~100 meters across and is full of helium gas. The balloon reaches a height of approximately 36 kilometers, which is within the Earth’s stratosphere. The telescope that sits underneath is 0.8 meters in diameter. 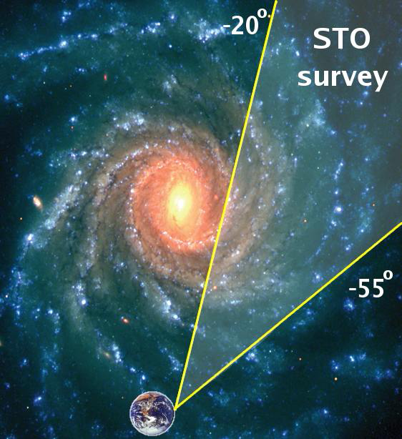 The STO-2 science objectives are to look at Cold Dark Clouds in the interstellar medium of the Milky Way galaxy. These clouds are thought to further condense into Giant Molecular Clouds, where star formation takes place. Giant Molecular Cloud studies have been ongoing for several decades, but this mission will be one of very few to directly observe the Cold Dark Clouds, and will help us understand how Giant Molecular Clouds form. We will also study how interstellar clouds get disrupted by nearby high mass stars as they give off intense solar wind, and later from supernovas as they die. 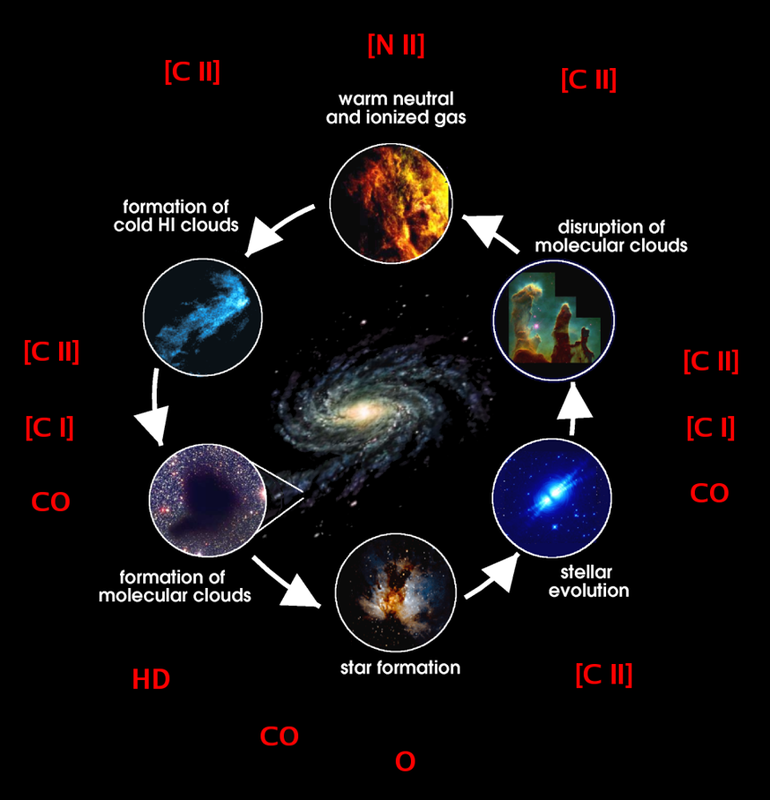 A diagram showing the lifecycle of gas and dust in the Milky Way. The diagram shows which dominate species of observable chemical transitions are used to study each phase. The STO-2 mission observes CII and NII and OII emission. The STO-2 telescope looks at these cloud regions and uses three separate terahertz detectors to record data from these clouds. Each detector is specifically designed to look at photons emitted by different chemical transitions within the Cold Dark Clouds. Together, these three emission profiles help determine important properties of these galactic clouds, including: distinguishing which cloud type we are observing, what the temperature of the cloud is, where the cloud is located within the galaxy (3 dimensionally), how thick the cloud is, how the cloud is moving internally (rotating, expanding, etc), and the what the radiation environment surrounding the cloud is like. This information will lead us to understanding the higher level questions of: what is the complete lifecycle of interstellar gas, study the creation and disruption of star-forming galactic clouds, determine the parameters that effect star formation rate in the galaxy, and provide templates for star formation and stellar/interstellar feedback in external galaxies. The survey region of the STO-2 payload. We will look at a significant fraction of the galaxy which includes looking through the spiral arm and inter-arm regions. The STO-2 mission is scheduled for launch from McMurdo Station in Antarctica in December of 2015. 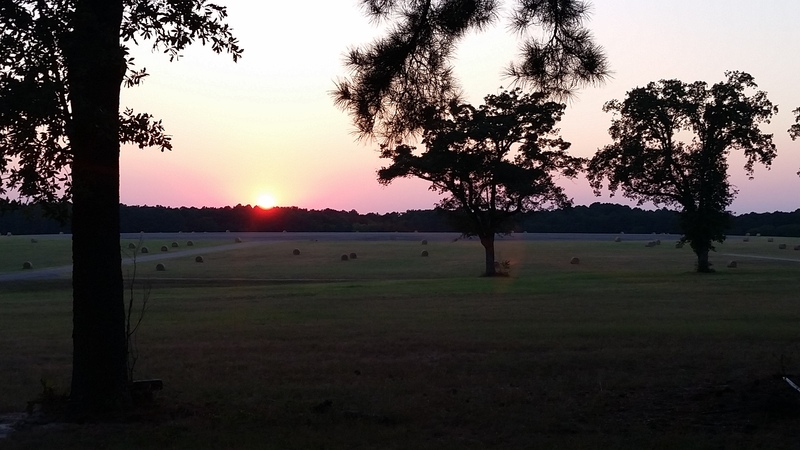 Recently, I traveled to Palestine, TX to help with the integration and testing of the STO-2 payload. This test is critical to to ensure that the instrument is balanced and all of the equipment fits into its specified location, make sure that the data collected by the instrument is properly stored by the onboard computers and relayed by satellite to mission control, and to test that that the telescope is properly aligned and can receive satellite pointing commands. 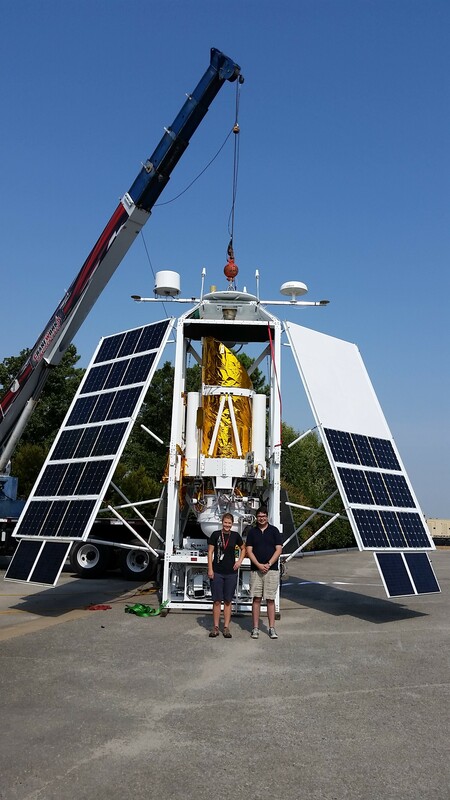 There are two major ‘teams’ working on the full STO-2 payload. The first is the instrument team, who are in charge of making sure all the receivers are working properly. The receivers we use are Hot Electron Bolometers (HEBs) for our CII and NII emission. These detectors need a lot of support electronics to make them work properly, and so the instrument team is in charge of focusing the light from the secondary mirror onto the detectors, through a series of lenses, mirrors, and windows. We also shine a second, high powered light source created by us onto the HEB detectors, which acts as a light ‘pump’ for our detectors. We call the light pump a Local Oscillator (LO). The HEBs convert the photons from the LOs and the gas clouds into lower frequency electrical signals. The electrical signals get amplified and converted into digital signals, which are read by our spectrometers. A lot of the electrical equipment, especially the HEBs, need to be supercooled to function properly. The camera sits inside a big dewar, which holds liquid helium at 4 degrees above absolute zero. The instrument team is not only responsible for making sure the electronics are properly aligned, they also need to make sure each piece of equipment is kept at its desired temperature. Members of the instrument team working on the electronics outside of the dewar during the Hang Test. The dewar is the white tank in the middle-left of the image with a lot of electronics boxes attached to it. We paint everything flight-worthy white to reflect as much sunlight as possible which helps keep it cool. The other team for the STO-2 mission is the telescope team. 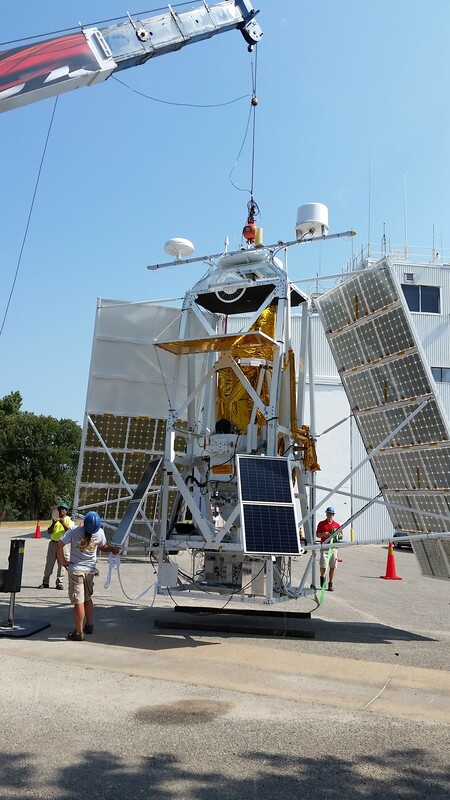 While the instrument team sets up the receiver system, the telescope team sets up the majority of the structure of the payload as well as a lot of support systems. The telescope team handles the telescope itself, which is the primary and secondary mirrors, sitting along the long gold baffle. They also set up the guidance system, which uses visible light cameras to triangulate which direction the telescope is pointing, and uses gyroscopes and reaction wheels to keep the telescope steady and slew it back and forth to take an image of the cloud regions we study. The telescope gondola has two sets of solar panels to provide power to the telescope subsystems, and we have batteries on-board to store the extra energy. The telescope team is in charge of thermal control for all the equipment that isn’t cooled by the helium tank in the dewar. Finally, the telescope team provides contact to and from the telescope, which allows us to communicate via satellite with the telescope while in flight to check on its stats, upload pointing commands, and collecting the data through mission control. The telescope with the dewar attached but before the solar panels are installed. The guidance system has also not been installed underneath the telescope. The gondola pictured here is just shy of 20 ft. tall. 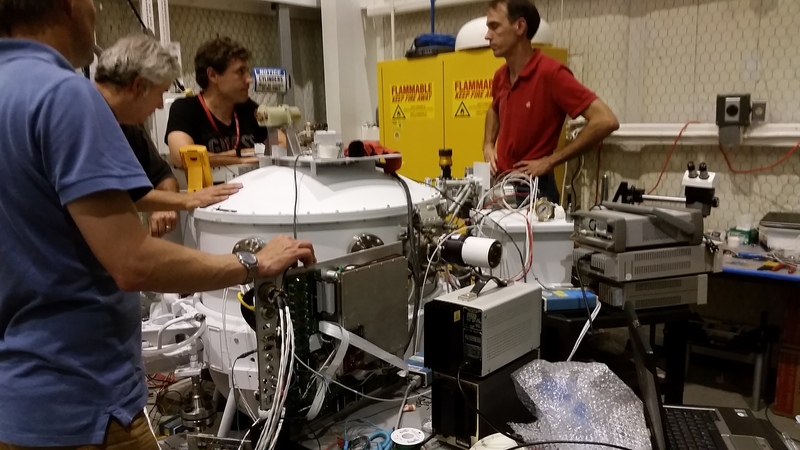 The hang test is the first time that the instrument and telescope come together and all the electronics are hooked up to each other. The hang test takes place at the Columbia Science Balloon Facility in Palestine, TX. It is a small NASA center where they used to launch balloon missions, but cannot do so any longer now that Palestine is a booming metropolis (heh). 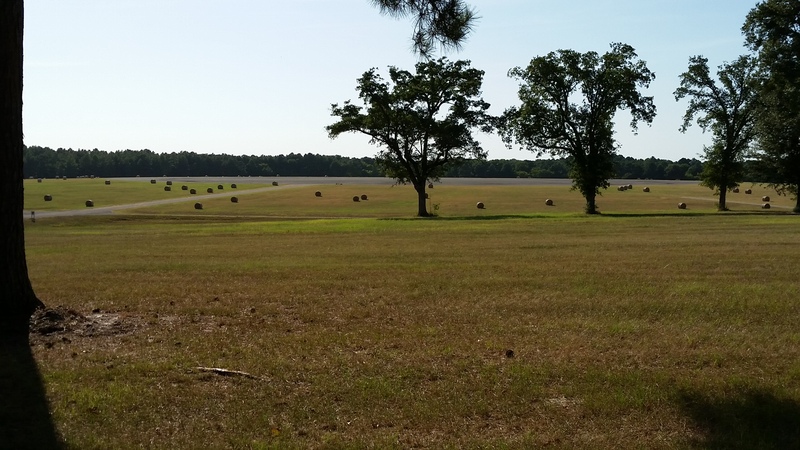 You can still go out and see the gigantic launch pad, which is a 1000 ft diameter concrete circle, surrounded by an even wider open space now used for growing hay. The CSBF launch pad during the day (lower) and at night (upper). I wanted to include the sunset picture because it was very pretty. It was not as hot in Texas in August as in Phoenix, but it was about 3 times as humid. You can’t see the launch pad as well from these angles, but it is very large and quite pleasant to take a stroll around. During the hang test, the entire gondola payload is actually hung from a crane! The test not only tests the hardware system but also the software system, which is very complex, elegant, and designed by the STO-2 team specifically for this mission. The dewar and the telescope are integrated inside a large hanger. On the day of the test, a crane in the hangar lifts the payload to the door, where it is transferred to a separate crane and taken outside. The hanging payload is free to point and rotate, and it can communicate via satellite. Mission control (Houston) send pointing commands to the gondola, and the team can determine if the telescope is pointing correctly. We also take some ‘fake’ data and make sure it is stored and processed correctly. Since things went well, the hang test only took ~ 3 hours. However, there were two straight weeks of 10-16 hour days necessary to get us to that point (and one 22 hour day!). The success of the hang test shows that the mission is prepared to be sent down to Antarctica for launch. The entire system has to be taken apart to be shipped, so all that hard work gets immediately torn apart. 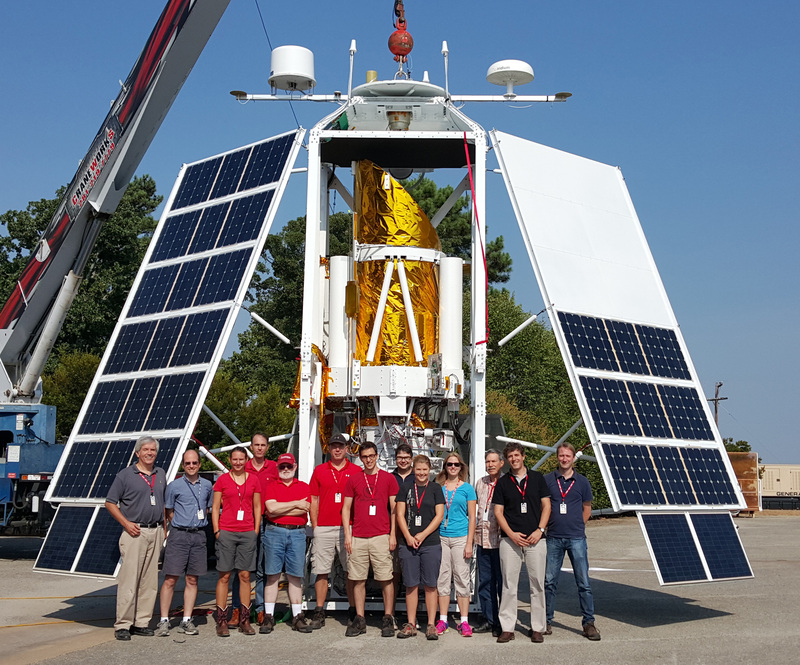 The STO-2 instrument and telescope teams in front of the complete instrument gondola. Hang test success! The gondola only needs to hang by a few feet to be able to swing properly. You can see the back sides of the solar panels in this view, as well as the instrument support package underneath the dewar. The communication antennas are sticking out on the boom at the very top of the payload. Me and my adviser Chris Groppi with the payload. You can see the extent of the instrument better in this view.